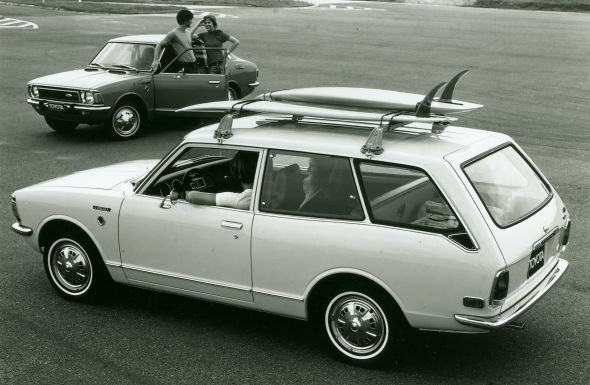 The all-new, second-generation Corolla was introduced to the market in 1970. After the sensational appearance of the first model, Toyota was keen to build upon the car’s favourable reputation, develop the discerning tastes of its buyers, and build within them a sense of brand loyalty. Meticulous attention was given to developing a vehicle that presented immediately noticeable advancements over its predecessor. Based on that idea, the new model was given greater comfort with an expanded body size and enhanced overall driving performance. Japan’s economy was rapidly growing and the introduction of the second-generation Corolla was developed with a booming future in mind, and was instrumental in the expansion of Japan’s motorisation. 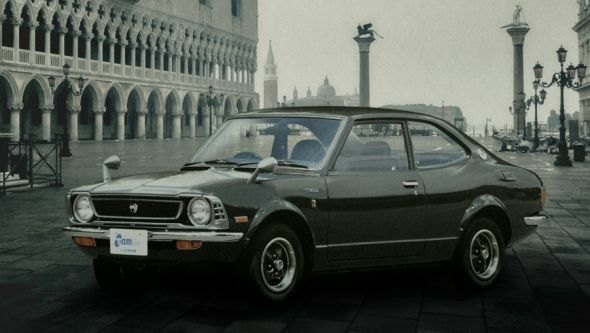 Production volume of the new model was dramatically increased, which swiftly led to Corolla reaching a cumulative production total of one million units in June 1970. 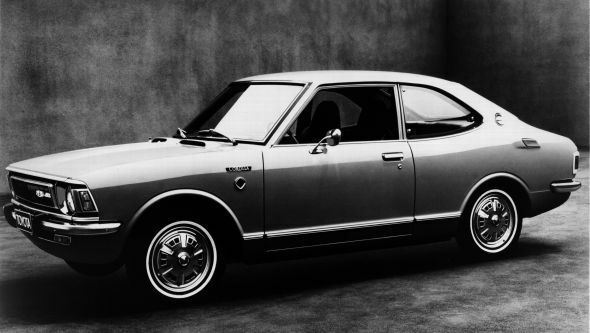 Work on the second-generation Corolla began in 1967, approximately one year after the launch of the first-generation car, and once again it was developed under the direction of Tatsuo Hasegawa. Improving on the Corolla was not an easy proposition for it was already a class-leader and a sales phenomenon. Additionally, the development and focus of the next Corolla was now seen as instrumental in forging the direction of Toyota Motor Corporation. Hasegawa’s initial plan revolved around refining the position of Corolla within Toyota’s entire vehicle range. He noted that the Corona model sat in the class above with an engine displacement of 1.6-litres, and during the mid-life refresh of the first-generation Corolla he had already expanded the original 1.1-litre K-series engine to a 1.2-litre displacement. Despite this increase, the development team recognised that there was still a substantial gap between the two cars in terms of engine size, so therefore hatched the Celica/Carina plan to fill that intermediate space with a new model powered by a 1.4-litre engine. Always viewed with one eye on Corolla development, part of the plan was to make use of this new engine in high-spec versions of the Corolla. In terms of design, the team faced a major decision about whether to evolve Corolla’s appearance or introduce a new, more daring look. 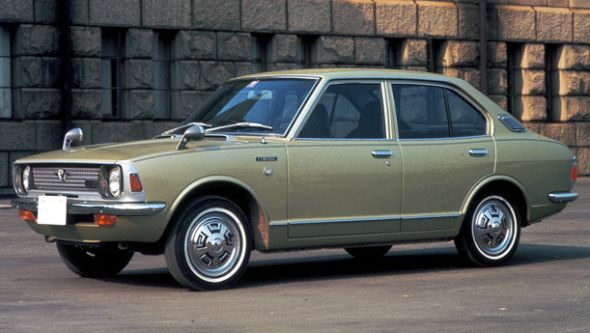 Looking back at the history of Japanese vehicles, the team saw many examples of failures in second-generation models after manufacturers refused to make significant changes. However, they also recognised that major alterations required financial boldness and produced far greater engineering challenges. After much deliberation, it was decided that a path between the two was the best option, so set about producing a design that was noticeably different yet recognisably ‘Corolla’, and that put greater emphasis on delivering gently curved surfaces. In the end, the second-generation Corolla enjoyed dramatic success as a family car, following the trend set by its predecessor. 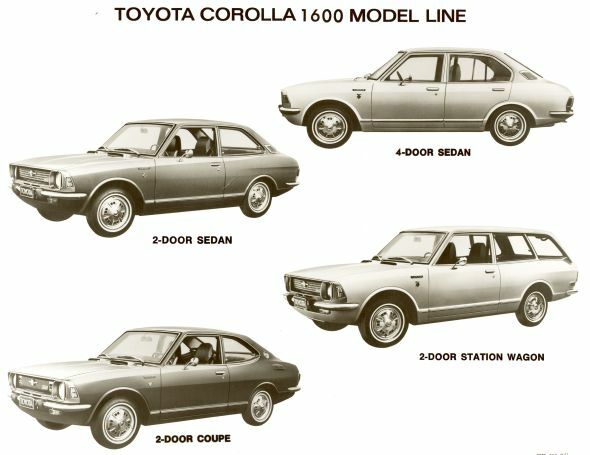 A total of 2,406,860 units were produced until the switch was made to the third-generation Corolla in 1974. 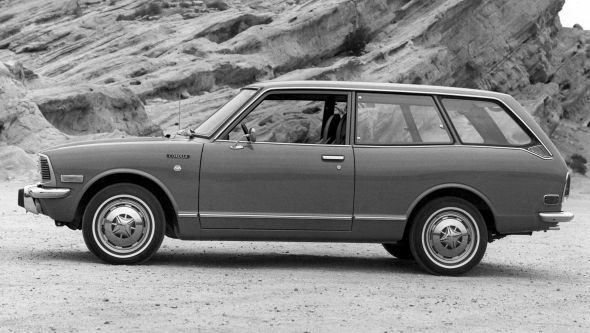 In addition to the two-door saloon, four-door saloon and two-door estate offered in the previous model line-up, the second-generation Corolla saw a coupe added, creating a total of four body types. Indeed, a major characteristic of the second-generation Corolla was in the expansion of sporty models. Among these was the launch of the Corolla Levin (‘levin’ means ‘a bolt of lightning‘). It was the suggestion of a young designer with a passion for rally cars, whose idea was to equip one version of the Corolla with a powerful double overhead camshaft (DOHC) engine donated from a larger model and introduce the vehicle into domestic motorsport. The idea intrigued motorsport fans within the design and development teams – to such an extent that the Levin model (also known by its TE27 chassis code) was immediately incorporated into the development process. 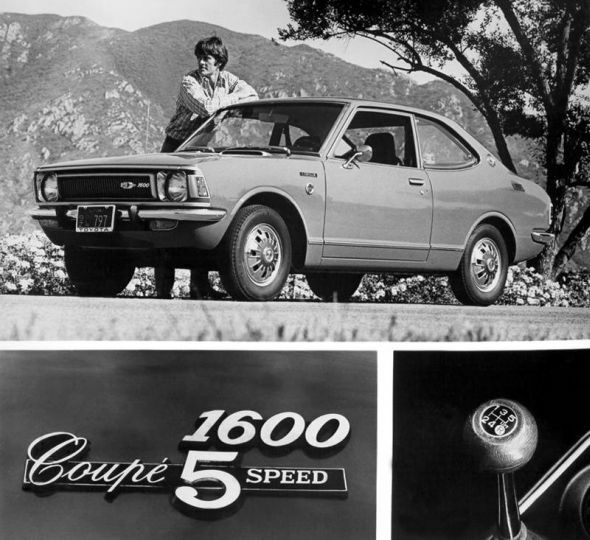 From its launch in March 1972, the powerful new top-of-the-line Levin coupe acquired many fans and brought a high-performance model to the Corolla model range. On its initial release, three engine variations were available in the second-generation Corolla, all carried over from the previous generation. These were the base 1.2-litre single carburettor 3K engine, and its two derivatives, the twin-carburettor 3K-B and high-compression 3K-D. Shortly afterwards, a range of newly developed 1.4-litre T-series engines were added to strengthen the line-up and improve Corolla’s dynamic performance in the approaching high speed era. While the new T-series engine shared similar fundamental structures with the K engine, crossflow-type intake and exhaust ports and double rocker shafts were adopted to improve intake and exhaust efficiency. In addition, advanced technologies such as hemispherical combustion chambers were used to increase combustion efficiency. Like the K-series units, the new 1407cc T engine was available in various forms. The range started with a base, single carburettor powerplant that produced 86PS at 6000rpm and 85lb/ft torque at 3800rpm. From that came twin-carburettor T-B and high-compression T-D versions with 91PS and 95PS respectively. The broad, Corolla engine line-up was then completed with the powerful, Solex-carburetted 1588cc 2T-G twin-cam that offered 115PS at 6400rpm and a maximum torque figure of 105lb/ft at 5200rpm. Used to superb effect in the larger Celica model, Levin was the only Corolla model to be fitted with this engine; and with a kerb weight of just 855kg to haul it delivered sparkling performance and a top speed of 118mph. So equipped, the Levin demonstrated spectacular success in all types of motorsport – most dramatically in the 1,000 Lakes Rally in 1975 (see image below), where Corolla was victorious over its European competitors. As a result, the 2T-G became a legend in the history of Toyota engines. New mechanical features were evident elsewhere within the new Corolla’s drivetrain. While four-speed transmission was now a class necessity, Toyota opted to equip the sporty models with five speeds (effectively a four-speed transmission plus an overdrive gear ratio) to increase refinement at speed. For the front suspension, a new torsion bar stabiliser was incorporated into the MacPherson struts, while at the rear the length of the leaf springs were expanded to improve handling stability and ride comfort. More models within the second-generation range were equipped with disc brakes. These were fitted with proportioning valves to prevent the rear wheels from locking during emergency braking. In addition, high-grade models adopted tandem master cylinders as standard equipment to enhance stopping power in view of the higher speeds now possible from the increased power outputs. During the late Sixties and early Seventies, Japan’s highway infrastructure was rapidly improving. Indeed, a year before the new Corolla’s launch, a new highway from Tokyo to Nishinomiya in Hyogo Prefecture was fully opened. It stretched a distance of approximately 300 miles. In order to cover the entire distance of this highway without needing to stop for fuel, a larger 45-litre fuel tank was installed. 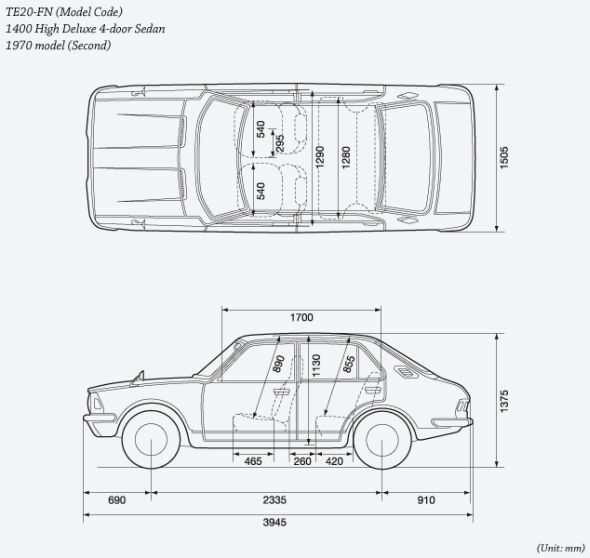 Compared to the first, the exterior dimensions of the second-generation Corolla were expanded one dress size, so to speak, and a dynamic form was created through the use of more rounded lines and surfaces. The new coupe model was designed to be slightly different from the long nose, short boot appearance of the saloons, by adopting a full fastback style to further emphasise its sporty image. A major styling characteristic of the second-generation was the deletion of the triangular quarter light windows in the front doors in favour of one unbroken pane of glass. As these openings used to supply much of the fresh air entering into the cabin, their deletion was more than made up for by the inclusion of two large, hooded air intakes in the front scuttle panel between the windscreen and bonnet. The incoming air could then be distributed around the cabin through adjustable vents either side of the instrument panel. This turned out to be a stylish accent, while accomplishing functional ventilation that met the needs of overseas markets. High seatbacks with integral headrests were fitted for increased comfort and safety, while at the same time the sliding range of the front seats was increased to offer more latitude in the driving position. Considerations were also given to storage space, so an accessory compartment was provided together with armrests in the rear trim of two-door models. Heater switches and ashtray illumination was provided for better nighttime usability, and this lavish new generation Corolla was the first to be equipped with amenities such as an AM/FM car stereo, air conditioning, windscreen washers and the safety feature of conical, glare-proof glass over the dashboard instruments. All in all, the new second-generation Corolla offered greater competence and comprehensively enhanced performance for the high speed era. Thanks for contacting us. You will need to contact a Toyota Centre in your region as they will be able to assist you further. Hi, I have 1973 corolla from my grand father, it’s really very hard to get parts for these models now. Does anyone know where can we get parts for this model?? Toyota UK?? Thanks for getting in touch. We’d advise contacting our Customer Relations team as they’d be in the best position to assist you. You’ll be able to find their contact details here: https://www.toyota.co.uk/contact-us. which type of parts do you need?, body, engine, suspension etc? In pakistan so many parts available. you send detail i can check from the vendors and let you know. Hi, you can call me in Indonesia on WhatsApp. There are tons of parts available here for the older corollas. +6281353313790. I’m American married to a Balinese woman by the way. This is a wonderful story. Thank you for sharing this with us. Do you know where I can get the owner’s manual for the 1973 Levin model? We’re looking into this for you, when we hear back from our team we will let you know. Many thanks. This is a Japanese Import vehicle, therefore no owner’s manuals are available for this model. Unfortunately, we don’t have access to any manuals for vehicles from Japan as the vehicle was not destined for sale in UK. i want to perchase this car can any one tell me about this car ? Thank you for your post and interest in the Corolla. Unfortunately this model has been long out of production. However, Corolla can be seen at classic car shows and events. Hope this helps, many thanks.